What’s a warm winter chili recipe without a side of cornbread? 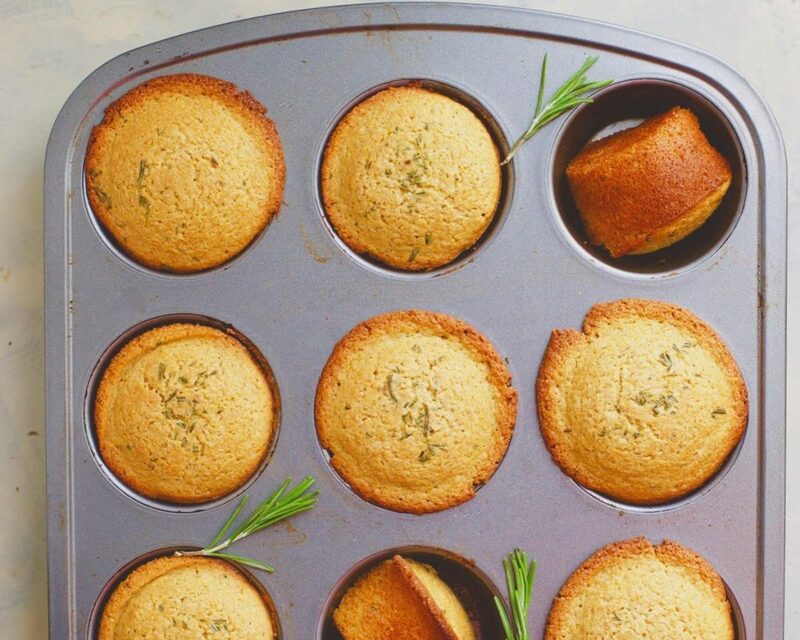 Spruce it up a bit with our Rosemary Cornbread Muffins! They have the classic taste and texture of your favorite cornbread recipe, but with a twist of added flavor from the rosemary. Rosemary is one of our favorite herbs with its distinct taste and savory aroma. It is in the same family as mint. This herb has been researched to have many antioxidant and anti-inflammatory properties. We used the rosemary to accent the cornmeal, oats, eggs, and other yummy ingredients used in this recipe. That’s right, folks- this cornbread recipe has a few added twists! Traditional cornbread is usually made with (lots of) buttermilk, sugar, and butter. With some (okay, lots of) experimentation, we replaced those ingredients for healthier counterparts, and totally nailed it! Let’s get to baking by preheating the oven to 400F. In a bowl, combine the oat flour, corn meal, baking powder, salt, & rosemary. To make oat flour, blend rolled oats until flour-like consistency is reached. In a separate bowl, lightly whisk the eggs, maple syrup, nut milk, and coconut oil until uniform. Add the wet ingredients into the dry, and whisk together lightly until the batter is consistent. Pour until almost full into an oiled 12-cup muffin pan. The batter should be enough for 8-9 muffins. Bake for 20 minutes. Enjoy! These Rosemary Cornbread Muffins can be refrigerated in air-tight container for up to a week, or frozen, left at room temp, and reheated in the oven, which makes them perfect for making ahead of time so that they’re ready throughout the week. Enjoy with eggs for breakfast, as a side to your main course, or even as a mid-day snack! They taste best when reheated in the oven. Do you have any fun cornbread recipes that take a spin off of a classic recipe? Let us know what you think in the comments below!